Ring News 24Boxing News Breaking Boxing NewsDid Amir Khan swerve Bradley Skeete? 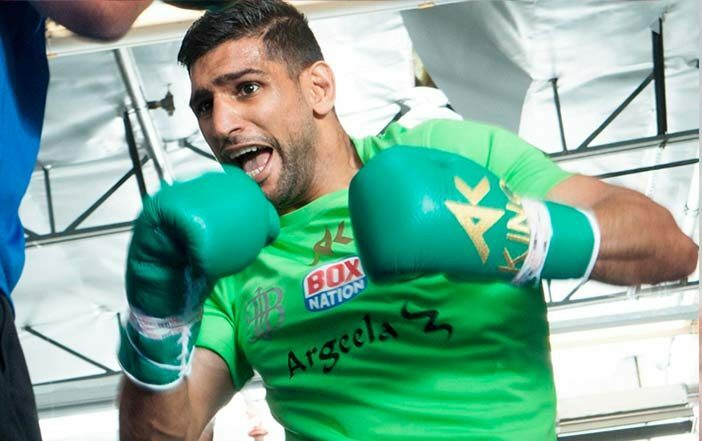 When Amir Khan’s homecoming and subsequent three-fight deal with Matchroom was announced, fans were wondering who would be in the opposite corner in his first fight back – scheduled for April 21. There were plenty of options and names being bandied about and eventually it was announced that Canadian Phil Lo Greco had got the gig. Promoter Frank Warren recently revealed to BoxNation that he had reached out to Matchroom and offered up the name of one his fighters for the gig. Penge welter Bradley Skeete was the man put forward. Aged 30 and boasting a 27-1 record (12 knockouts), the last time Skeete crossed the divide and wound up on a Sky Sports undercard he was busy dishing out a schooling on Eddie Hearn’s Commonwealth welterweight champion Sam Eggington. So while “swerve” might be a little strong, given Khan’s propensity for a challenge across his career (see Canelo, Maidana etc), I have no doubt that the Bolton man fancied a slightly easier, less mobile operator. Lo Greco will for the most part present a static target for Khan to find quickly and hurt as much as possible. Skeete would have the potential to make a returning Khan look bad, seeing as Bradley is able to box nicely and move around the ring with fluidity and purpose. Skeete’s career is in danger of atrophying slightly if he does not get a move on. I’m all in favour of a young fighter learning his trade, solidifying himself at British title level and winning the Lonsdale Belt outright, but at some point Bradley needs to move on. I’m sure he has lofty ambitions and his team are working diligently behind the scenes to secure him a matchup on the next level, but his most recent opponent named for the since-cancelled February 10 ‘Untouchables’ card (lowly Hungarian Laszlo Toth) was wholly uninspiring. Skeete’s only loss so far came against Frankie Gavin who was then a British-level rival in the Warren stable. It was a close and competitive fight that took place on the same card as Tyson Fury-Dereck Chisora II and Billy Joe Saunders-Chris Eubank Jr. Some felt Skeete had actually done enough, although I felt that the often underwhelming Gavin just nicked it. Skeete rebuilt with defences of the inauspicious WBO European bauble but it was his British title reign that has propelled him to the cusp of world honours. Towards the end of 2017 it suddenly looked plausible that a shot at Australia’s WBO welterweight king Jeff Horn might come about, but Horn opted instead for British rival located further down the pecking order than Skeete in the form of Gary Corcoran. Again it was a case of a fighter arguably giving Skeete the swerve and branding him as a high risk, low reward option. Currently ranked highly by the WBO and the IBF, Skeete’s opportunity to box for a world title would appear to be fraught with danger and promoter Mr Warren will need to pull a few strings if he is to get his man an easier chance with one of the governing body’s. Errol Spence Jr holds the IBF and Terence Crawford is a red-hot favourite to relieve Horn of his WBO crown if and when the pair clash on April 14 as expected. I would like to see Bradley Skeete get a big fight in 2018 and I would not complain if he was Amir Khan’s second or third opponent on the former world champion’s comeback trail. However, it is unlikely that Skeete will be presented with too many opportunities and will continue having to do things the hard way for his shot at world glory.